SALT CANDLE HOLDER & DECORATIVE SALT PRODUCTS. Dear Customer: You must read care instructions before using the products. Keep products in a dry environment at all times. Since salt is natural minerals and has hygroscopic properties therefore you should not allow your lamp to become wet. If it does become wet do not use a high level of artificial heat to dry it. Simply, leaving it switched on will dry it thoroughly. If there is any risk that electrical fitting might have become damp it must not be switched on. Simply place it in a cupboard or any similar warm place. Do not use the lamp again until the electrical fitting has been checked by a qualified electrician. Our electrical lamps use standard 15watt screw bulb and the electrical fitting can easily be removed by depressing the spring clips where it fits into the base. Please ensure that the lamp is switched off and unplugged from the main power source before you insert, remove or replace electrical fitting. The Salt Lamps and T – Light Holders are not suitable for bathroom, kitchen or any other rooms in which there is an abnormally high moisture level. Keep the lamp away from water and do not place it on damp surfaces. Salt products are hygroscopic which means that they naturally absorb moisture from the surrounding environment. If you find the surface of salt lamp is wet or damp, plug in the electrical fitting. The heat from the 15watt bulb should be more than enough to warm the lamp so the water evaporates from its surface. Excessive sweating can occur when the lamp is placed in a high moisture environment where there are extreme weather changes where humidity is very high. The effect of this is that the lamps surface area will begin to sweat heavily as it works to repel excess moisture that maybe in the surrounding environment. 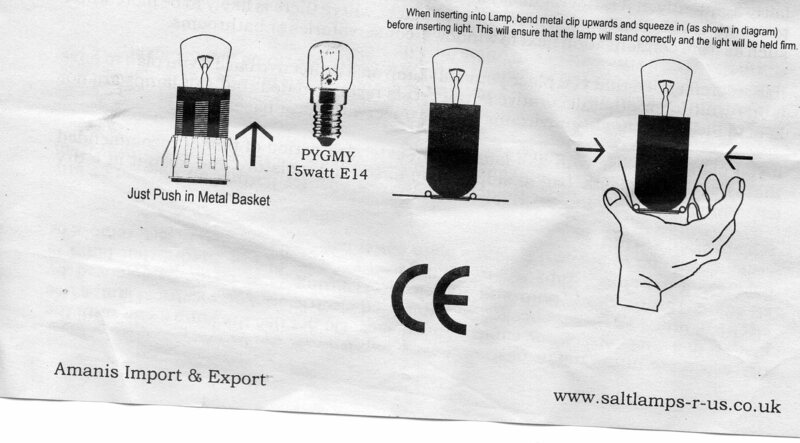 We recommend using the lamp fairly frequently. If it is not regularly lit up it can continue to absorb water and can start to crumble. This can happen more often in places where there is likely to be more water such as from condensation next to windows, conservatories or bathrooms. It is recommended that you place your salt lamps on a protective base if you plan to have it on furniture or other decorative surface. It is recommended that salt lamps are not kept in the high humidity environment like bathroom, kitchen, conservatories or basements. If you plan to not use your salt lamp for an extended period of time it’s recommended that it’s sealed in a plastic bag to stop it from absorbing moisture and keep it in a dry environment. Caution: A burning T-light is an open fire. Never leave a burning T-Light unattended. Keep out of reach of children and pets. Do not use salt lamp and t-light holder on a glass table or wood table without protective base. Please fully read instructions and keep safe for future reference. Always unplug the socket from the main before replacing the bulb and take care as the bulb may be hot. Place lamp and cable out of reach of young children. The plug is fitted with a 3AMP fuse and must only be replaced with a 3AMP fuse. The lamp is designed for display only. It is not intended as a light source and should not be left unattended. Do not have lamp plugged in to main supply. Gently pull flex out from crystal base until you can grasp the lamp holder and spring clips. Squeeze clip and slide lamp holder from the lamp base. Screw supplied bulb in to holder (PYGMY 15watt E14) and squeeze clips as you insert the lamp holder in to the lamp base. The holder should be pushed just past the wooden base it sits correctly within the crystal.